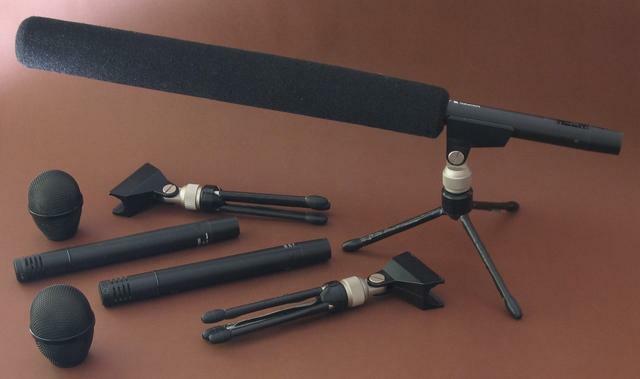 For all those people who've been internet searching for information on these microphones, I've seen a variety of questions asked about these microphones on the net, and some wacky answers. When I bought mine (brand new) in the 1990s, there was an older CM-100 model that ran off a 1.5 volt AA battery, and a newer and better CM-300 model which ran off a similarly sized 9 volt battery. And, I was told that there was a different back-end that could run off phantom power, but I have no information about it. I've seen mention of phantom supply modifications to the battery-powered back-ends, on the net, but no actual examples. Though it ought to be easy enough to put DC blocking capacitors between the XLR and transformer, resistors from the XLR to battery compartment, and fit filtering capacitors and a voltage regulator into the cavity. But I've never bothered with doing any phantom modifications, because my portable recording equipment doesn't provide phantom power, and I don't particularly like it (hums from inadequate supplies, hideous crackles from any intermittent leads, and potential wrecking of non-phantom equipment). Since writing this page, several years ago, I have done a modification to my Nakamichi CM300s to run from phantom power (that page details how to do it, for anyone who wants to modify their own). I've found that electret microphones with higher battery voltages to drive their pre-amplifiers seem to be better at handling very strong audio levels without overdriving. Plus, the battery can flatten quite a lot before it's too flat to work. The batteries do last a long time, but the microphone signal quality drops significantly by the time the battery gets to around 6 volts (sensitivity drops, and it sounds muffled). They aren't going to work, or work well, if you put a 1.5 volt AA cell into them. The original 9 volt batteries aren't available, anymore (they were banned for containing mercury). Alternatives were available, and probably still are, but are hard to find, and might need to be imported. I just tape together six LR44 cells, wind cardboard around them to make them a snug fit, and insert that into the battery compartment with a banana terminal sitting on top, so it's the right length. They're easy to buy everywhere, cheap, and still last a long time. I might get a year or two's use out of them, so long as I don't forget to switch them off between sessions. The batteries are more likely to go flat from self discharge, than the microphone draining them. If you're worried about leakage, you could use the more expensive SR44 cells, but I haven't had any leak, yet. Another solution would be to extract the 3-pin XLR, replace it with a 5 pin, wire the battery terminals to the other two pins, and use an external battery box. Or, for the brutal approach, drill a tiny hole in the casing to bring out wires for an external battery. Then, either way, you could use those cheap rectangular 9 volt batteries that we used to use in 1970s transistor radios. But the build your own battery pack, described in the prior paragraph, avoids having to modify the microphone. The output is floating transformer coupled, can be used to drive a balanced line, or an unbalanced line (merely by grounding one of the output pins). Since the transformer is floating, it ought to survive being connected to a mixer putting phantom power out, though if it's not putting out exactly 48 volts on each leg, I wouldn't trust it.